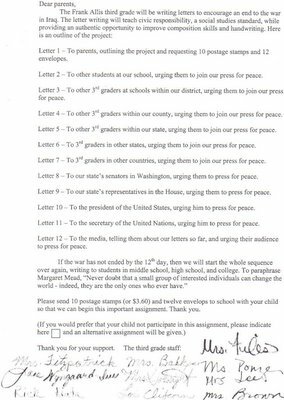 "The Frank Allis third grade will be writing letters to encourage an end to the war in Iraq. The letter writing will teach civic responsibility, a social studies standard, while providing an authentic opportunity to improve composition skills and handwriting." The assignment is basically to write 12 letters to everyone from other 3rd graders around the nation to congress, the Senate, and the media. "If the war has not ended by the 12th day [of the letter writing campaign] we will start the whole sequence over again, writing to students in middle school, high school, and college." The third grade staff then have the audacity to ask parents to send 10 postage stamps and 12 envelopes. The teacher then gives parents the option to opt out of the assignment. This is a basic problem with Madison and the group-think that exists here. These teachers are politicising THE THIRD GRADE!! A third grader doesn't know what is right or wrong (the age or reason in the State of Wisconsin is 12), so they will take the teacher's bias as FACT. Under no circumstances should children be put in this situation. Update: The school district rescinded the assignment today. But the fact that it got this far is scary and the school district should take a good look at the Principle that let it get this far and the teachers that signed onto it!